Does Weber offer an infrared grill? I'm a huge fan of Weber grills, in fact my charcoal grill is a Weber kettle that has endured years of abuse. I get asked all the time about if there is a Weber infrared grill. Sadly, Weber is yet to offer an infrared option. 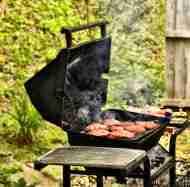 Those familiar with the Weber history know that they can sometimes be slow to adopt new technology until it is proven. While infrared grills have been around for some time, they are just starting to hit the mainstream market. As such, it may be some time until a Weber infrared grill. If you are looking for a grill with build quality similar to Weber, you might check out the TEC grills. Solaire also has some nice quality infrared grills at a lower price than TEC. For the time being, us Weber fans will need to remain content with other brands. One can only hope that we will have a Weber infrared grill option in the near future.